Last week, I made reference to our decision (made almost immediately after we launched) to strike a deal with a distributor to get our books into bookstores across the U.S. and Canada. At the time, it seemed like an obvious thing to do. We had never really thought about what we were doing or what it meant to be a self-publisher. We just knew that books are sold in bookstores, and we had a book to sell. We’ve learned since then that there are a lot more options than that, and that print distribution to bookstores is fraught with uncertainty and peril. It turns out that putting a self-published book in Borders and Barnes & Noble is like setting out to sail the Atlantic in the Santa Maria. (Have you guys ever seen a replica of the Santa Maria? It was a tiny ship!) And though I still think that decision was the right one, it was — at the time — the result of 50% audacity and 50% naiveté. Let’s talk audacity first. 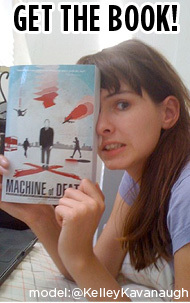 A traditional (but limited) print run was always a part of Machine of Death. Five years ago when we started planning the book, that was the only real option. Ebooks were still just a glimmer in Jeff Bezos’s eye, so we always envisioned the book in print. And even though things changed dramatically in the years since then, we never stopped to revise our plan. So when we decided to self-publish Machine of Death, we always expected it would require a hefty investment and that it would be accompanied by some level of risk. But we’d already spent thousands of dollars on stories and illustrations and book design — what was a few thousand more on printing? To a certain extent, then, the audacity was baked in from the beginning. We were perfectly willing to wager real money on the idea that we could sell a couple thousand books unassisted by a publishing company — at conventions, through TopatoCo, and in some limited way through Amazon. Nobody did any sales projections and there was no marketing plan, but in our guts this all seemed perfectly reasonable. But by noon on October 26 of last year, we were sitting at the top of the Amazon bestseller list for that day, and our audacity looked downright visionary. If we could sell thousands of books on Amazon in one day, it wasn’t such a big jump from there to think that we could sell thousands more in bookstores. It wasn’t until a couple months later, when I started trying to make sense of all our numbers, that I started to worry that we’d been too audacious after all. For a while there, I was pretty sure we had printed way too many books, and that we’d be driving a dumptruck to the pulp mill by August. These days I’m more hopeful that won’t be the case, but it’s hard to tell. After all, we’ve never done this before. We could easily sail off the edge of the world at any time. And that takes us to the naiveté. If we’d known exactly what print distribution entails, I wonder if we’d still have decided to do it. Perhaps we would have — after all, we probably couldn’t have predicted the Borders bankruptcy. And that event alone is the biggest factor in whether our print distribution is going to be profitable or not this year. 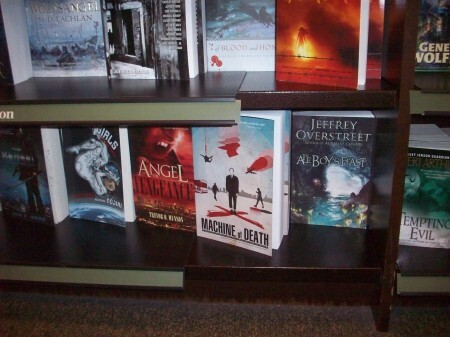 I don’t want anybody to take it as whining if I say that Ryan, David and I have not yet seen a cent from sales of Machine of Death. In fact, six months later we still haven’t been paid back for the money we invested to start with. As far as get-rich-quick schemes go, I can say that publishing an anthology is a terrible way to go. But like I said: This is not whining. In fact: This is how we wanted it. Fast forward to today, and we’re still letting it ride on things like the podcast, and the talent show, and now the sequel. Largely thanks to Borders, bookstore distribution turned out to be a much shakier proposition than we thought it would be. But over the next few months, we expect it to mostly pay for itself. (If we get lucky, we might even make a few bucks.) In the meantime, we get to walk into almost any major bookstore in the U.S. or Canada and go look at our book on the shelf. That’s awesome. Most people never get to do that! Not only that, but being in bookstores has given us thousands more readers — and if that’s all we ever get out of it, then it’ll be worth losing a little money. But I’m getting pretty far ahead of myself here. I promised a peek at our sales numbers in this post, so here’s what our print sales look like so far, starting with the week ending Nov 7, 2010. I left off the week ending in Oct 31 because that’s the week we launched last year. We sold a ridiculous number of books that week, so including it just makes everything lopsided for no good reason.If you’re a completist and want to see what it would look like, just draw a blue line on the far left side reaching up and up way higher than anything else on the chart. But that’s the fluke week — the unrepeatable one-time-only high point. What’s more interesting are the numbers since then. And print sales have been trotting along quietly and consistently ever since November — not showing off, but not slacking off either. I love looking at this chart for a couple reasons. First, as exhilarating as it was to be a #1 bestseller, that really only lasted for 24 hours. But it’s humbling and awesome to me that six months later, we continue to sell books. Most weeks when I check the numbers on how many new readers we have, I’m pleasantly surprised to find it’s higher than I expect. Not because our sales our going up, but because they refuse to go down. We dropped off very quickly after the initial launch, but once we found our level, we’ve stayed there. And that’s amazing and gratifying to me. We’re not just a one-time flash in the pan — we’re a real book that continues to reach new readers every week. What’s cooler than that? The second thing I love about this chart is the eerie flatness of our sales. The level of print sales we have now is not much different than we had shortly after we launched. Check the chart — the week ending Nov 7 was a big one, but the week ending Nov 14 had about as many sales as recent weeks in March and April. I find this endlessly interesting. It’s one of those miracles of economics and human behavior — roughly the same number of people choose to buy our book every week. And this continues week after week, for months on end. Even when there’s a major event that temporarily changes the level of demand (like the holiday shopping season), it soon returns to the same level. This won’t continue forever, obviously. Over time, the demand will fall simply because more books are competing for the attention of readers every day. (Considering last week’s results, maybe it’s already happened!) It’s inevitable — but it’s still amazing to me that this happens in such an orderly fashion. 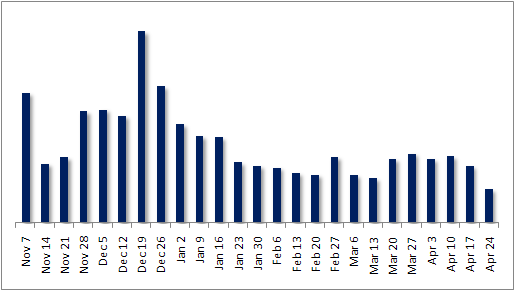 There aren’t wild fluctuations in our sales week to week — just a long stately trend. This isn’t unusual or unexpected, but it’s been really cool to watch it unfold. I probably should have started out by explaining what’s included in our print sales, but it gets a little technical. When you’re dealing with bookstores, it turns out that nobody can really tell you exactly how many books have been sold to customers — not in a timely fashion, anyway. The closest you can get is that intimate friend of many publishing professionals: the Bookscan number. Bookscan is a division of Nielsen that tracks point-of-sale data from Borders, Barnes & Noble, Amazon, some smaller chains and independent bookstores, and some other retailers that sell books (like drugstores and grocery stores). The pie chart above shows the breakdown of where Bookscan says our books have been sold in the U.S. (Technically, this is Bookscan mixed with a couple other data sources of our own.) These are sales to readers, by the way — not sales by our distributor to the stores themselves. There’s also some set of sales that Bookscan doesn’t track. Most people in the industry estimate that the untrackable portion averages 25% or more of total sales, but we don’t know exactly how big or small it is for us. We do know that Bookscan doesn’t track Canadian sales, and we’ve been selling well in the Great White North. So there’s some nontrivial piece of the picture we don’t have insight into. I admit that this isn’t the most interesting set of numbers, but it does show where our print readers are finding us. Amazon accounts for about 43% of the trackable sales, and Borders and Barnes & Noble account for about the same size chunk between them. This demonstrates just how big a liability a bankrupt Borders is. They’re a huge part of the bookselling market, and without them we’d have a much harder time getting in front of readers. 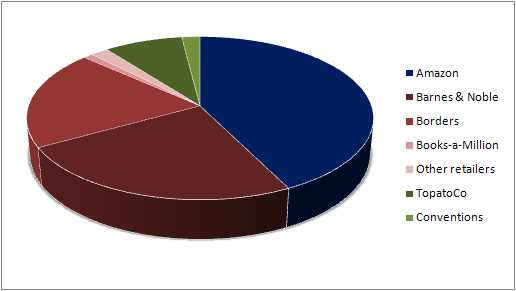 Other retailers account for a small sliver of the pie, and the remaining 10% (in green) are sales that we make directly to readers through conventions or TopatoCo. In general, the numbers we have don’t show much evidence of sales happening at independent bookstores. We don’t know if this is because they are sadly no longer an important part of the market, or if it simply means that Bookscan doesn’t track those sales. Machine of Death has become an amazing chapter in the lives of David, Ryan, and I. (And we hope for our contributors as well!) But it’s still just going to be one chapter out of many. There’s no easy road to fame and fortune here, but we’re still young, and Machine of Death is a great way to spend our time and energy for the time being. And no matter what happens, our experiences with the book and all its related avenues will be unique and valuable enough on their own. Rather than try to cash out of this somehow, we have made decisions to use this incredible opportunity to buy adventures for ourselves and our readers — and we’re totally fine doing that for as long as we can. I’m being touchy-feely here, but that’s because I hope a little touchy-feeliness will act as an antidote to any urge to hold up Machine of Death as an example of “the future of publishing”. Frankly, we have no idea what the future of publishing will be like. (We’re still figuring out the present of publishing.) The things we do are those that we think are the most fun and rewarding, as three guys with interesting ideas, a great opportunity, and most of our professional lives still ahead of us. Right now, a big part of that is this self-publishing experiment we’ve stumbled into — but it’s still just a single part of something that we can’t see the entire shape of yet. We’ll continue to follow this wherever it leads, of course, and we have plenty of ideas yet for ways to keep playing in this amazing, fascinating sandbox. And personally I hope that publishing will remain a part of the experiment for a long time to come. But in a crowded blogosphere full of “self-publishing experts”, we’re completely comfortable admitting that we really don’t know what the future will hold, for us or for anybody else in the industry. Though we are as excited as anyone to find out! Anyway, ebook discussion in my next post! It’s very cool to get this sort of insider look at the scary world of publishing. How many other books I bought last year keep on linking me to cool new things this way? None! Hope your experiments continue to work out this well! FYI – my recollection is that Bookscan is not oriented towards indy bookstores. They get a small sampling, but independent book stores are so diverse it doesn’t provide a comprehensive picture. My recollection is that the New York Times Best Seller list tries to draw from a more diverse pool, but it is still problematic. MB: Great insight! Our window into Bookscan is very narrow, so unfortunately we can only get context for what the numbers mean second-hand. So thanks very much!